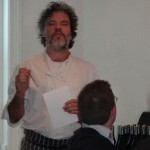 A sensational menu prepared by celebrity New Zealand Chef Peter Gordon accompanied wines from Misha’s Vineyard in Central Otago at The Providores and Tapa Room in Marylebone High Street, London on 3rd May. The menu was an eclectic mix of dishes with exotic spices and delicately prepared seafood and meats which matched the wines perfectly. The Providores and Tapa Room, featuring a popular formal dining room and a cafe/wine bar in the heart of London, is the home of the most exciting and innovative fusion food in the UK, and Britain’s largest range of New Zealand premium wines.